Whether you’re a marketer creating a branding message, a sales rep trying to impress clients or an executive seeking to increase productivity and revenue, the realm of B2B sales is one where sales cycles are long and the approach to explaining the value of your product or service to prospects is not one-size-fits-all. And with complex sales that require high levels of collaboration across organizations, the efficiency with which marketers can funnel content to sales reps can make or break a deal. But one company, Enhatch, a mobile enterprise tech software company, aims to improve customer relationships across the board by providing sales and marketing effectiveness tools. Inspired by the challenges CEO Peter Verrillo faced during his years of launching and selling complex medical devices, Enhatch leverages native mobile technologies to create a sales enablement platform with a simple intuitive interface and dashboard that connects marketing content to customer-relationship management and revenue. “The challenge that companies run into when selling complex products is that these sales efforts require a whole new level of connecting your marketing and messaging to your activity and sales process,” said Verrillo. Now organizations can improve their overall sales execution and maximize productivity by seamlessly integrating sales and marketing teams onto one mobile app. “In the past, to get the level of product that we deliver, businesses would have to custom develop the mobile platform on top of a Salesforce-type of software or one of these programs like Appcelerator, or they’re probably building it with raw code. And the people who are configuring the CRM are either private consultants or agencies that specialize in this work. 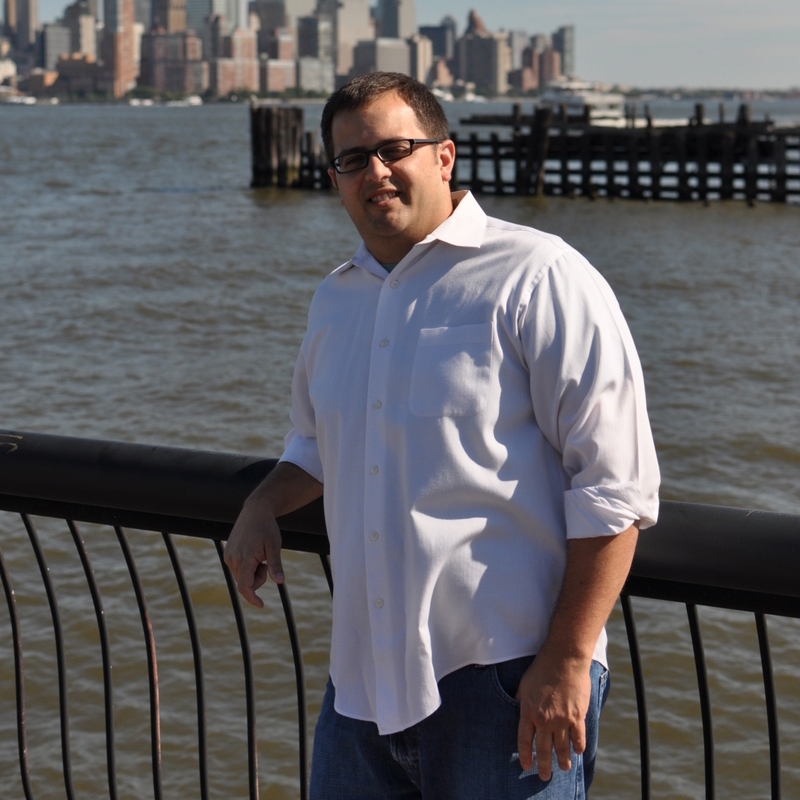 Our platform allows anyone in the marketing and sales organization to handle it on their own,” explained Verrillo. 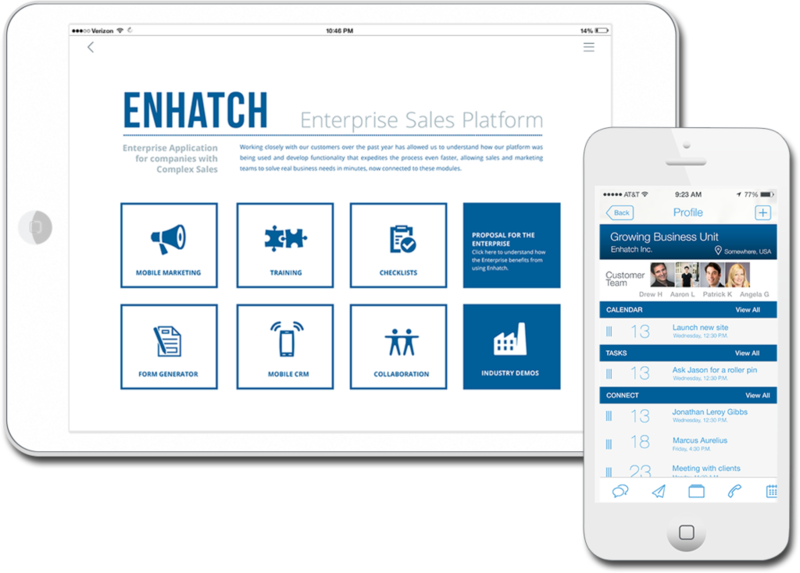 With Enhatch, users can design and deploy mobile apps tailored to their specific business needs and teams in minutes, creating real-time connections across their organizations. Sync and access marketing content anywhere, anytime and fine-tune your sales approach along the way. No more waiting for IT, or tracking down programmers. “We’ll conduct training sessions with our customers where we show them how the system works and get them going on the first app that they’re building. Once they’ve built that first app, they easily get the idea and can do a lot on their own without us. We’ve had a range of different users work with the app from interns to sales reps with 30 years of experience,” said Verrillo. The one-stop resource for sales reps can include presentations, videos, customer profiles, sales pipeline, calendars, 3-D modeling/animations and whatever other pitch tools marketers and salespeople deem necessary in order to shorten sales cycles and close deals. “In the past, sales reps have always gotten these tools called CRM pushed at them, but these were big management tools. They never really helped the person in the field sell better. When sales reps see what we offer, they always come back to us and say, ‘This is exactly what I’ve been wanting ever since I started in sales. This actually helps me sell,’” added Mark Birch, who joined Enhatch as CRO in January of this year. Once users receive an invite , they can install the app—currently available through iTunes—onto their mobile phones or iPads and access the tailor-made content. “We’re also opening up the ability to just share a link, in which case you can write someone directly by email, that person can click on the link and it opens the pitch directly to the website that mirrors their app,” said Verrillo. And built-in analytics provide marketers with real-time insight in order to measure content engagement and ROI on marketing and sales activities, while sales reps are notified of the activity and interest of each prospective customer on data points, including details as to which video or PowerPoint slide garners the most attention. “A lot of salespeople will send a proposal to a customer two weeks before a scheduled meeting. But it’s usually right before the meeting that customers will look at the content. And the benefit of using Enhatch for the rep is that they can see, ‘Ok, this person just looked at the proposal an hour ago and this is specifically what he or she was looking at,’” explained Verrillo. Another customizable feature is the virtual war room, which lets organizations create a central location for relevant information pertaining to their customers, as well as a collaborative space for their teams. “Every company has a different interpretation of what a war room looks like—it can include a real-time view of your customer’s financial revenue, or it can be a newsfeed concerning customer press releases,” said Verrillo. Current customers include medical device companies, such as Paradigm Spine, as well as several divisions of GE. “All of our customers—and every company out there—struggle with keeping their customers top of mind, treating them well and making sure that they’re pleased with the product. Our mission is to improve those customer relationships across the board,” said Verrillo. Inbound marketing has been the main source of promotion for the platform, but the team has also produced case studies to showcase the range of businesses across every sector that can benefit from using the mobile-first solution. “We’re very focused on applying Enhatch to different industries, so we need to create good examples for people to understand why our platform is a good fit for them,” explained Verrillo. The startup has also attended meetups, which have been a valuable resource for connecting with potential new customers, as well as for recruiting sales reps and developers for the Enhatch team. “If you’re a CEO and you’re not constantly on the lookout for new people to add to your team, then you don’t really understanding what you’re trying to accomplish in a startup. If you’re always on the lookout for big talent, you already know them when you’re ready to hire them,” Verrillo noted. Meetups are held several times a month at the tech-enterprise coworking space, Work-Bench, in Manhattan, where the company, which is headquartered in Hoboken, NJ, has had offices since December of 2013. “It’s a great location, where we’re working with a number of other companies that are pitching to the same types of customers—selling directly to big companies—and are also going through the same kinds of challenges as us, whether it’s conducting a security review for IT for developers, or constructing a sales process for the salespeople,” said Verrillo. The coworking space is just one of the resources available to the startup, thanks to NY’s evolving tech scene. “We are in an abundance of riches from an ecosystem standpoint—the availability of overall talent, the birth of things like General Assemb.ly and WeWork and all the other coworking and accelerator programs, and the number of VC firms planting a strong foothold and investing in the NY ecosystem,” said Birch. Currently, the company is focused on developing the platform further in order to make sales reps even more effective in their everyday jobs, and is also raising a round of funding. And as the company moves forward, Verrillo believes Enhatch will have a significant impact on the enterprise ecosystem.